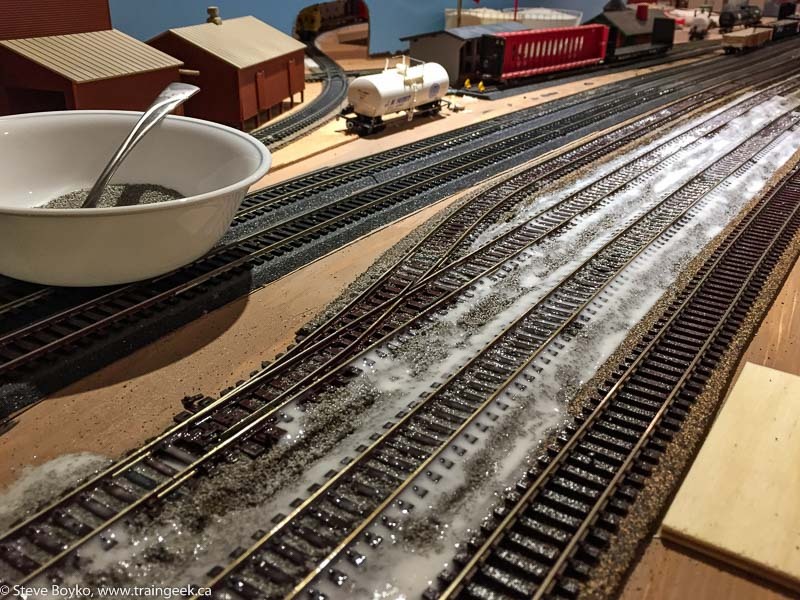 It’s been maintenance time on the layout for the past month or so. I decided it was time to do some more scenery, so I set out to do some ballasting in Georgetown on the CN side. I spread the ballast over the main track and the siding track. Then I sprayed it with a mixture of water and alcohol, to soak it, and dribbled on a mixture of white glue and water. So after a suitable mourning period, I laid more ballast down and did the same process, this time with a much greater concentration of white glue. I let it dry for about five days when I was away on business, and when I came back, it was hard as a rock and quite dry. A little bit did come up when I vacuumed, but not very much. There is still a lot to do!